Why do AquaTurbo® AER-AS Surface Aerators perform so well in wastewater? In general oxygen transfer to micro-organisms in wastewater occurs in two phases. Oxygen transfer only takes place at the contact surface between air and water; typically, in three forms. Oxygen transfer is not only influenced by the size of the contact area, but also the rate of contact area renewal. The water at the boundary layer becomes saturated almost immediately upon exposure to air. The primary function of a high-performing surface aerator is to achieve fast and continuous renewal of the contact area. This allows activated sludge with a low DO to be drawn into the aerator before being transformed into an oxygen-rich discharge. Oxygen deficit is the difference between actual oxygen content and the saturation value of the water. The greater the difference the greater the Oxygen Deficit. 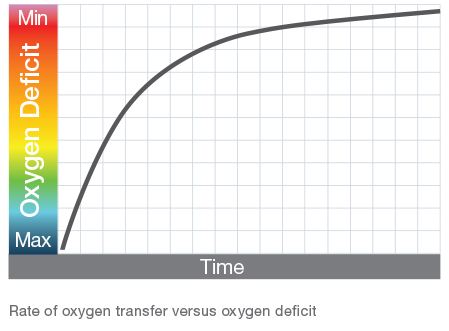 Maximum deficit is met when the actual oxygen content is zero. The easiest oxygen to transfer and the highest rate of transfer occurs when oxygen deficit is greatest and therefore DO concentration is at its lowest. The rate of oxygen transfer is inversely proportionate to DO concentration. Due to high velocities and high microturbulence, activated sludge flocs are divided into smaller flocs resulting in a greater contact surface area. The high exit velocity produces very small water droplets and consequently the activated sludge flocs are surrounded by a very thin liquid layer. The microturbulence within the basin induces very rapid movement of the small flocs in all directions. 1. Passage through the air: The activated sludge flocs are pumped up from the bottom of the aeration basin and are almost, if not fully, anoxic. They are brought in contact with ambient saturated air. The driving force at 10°C is 9.17mgO2/l versus 0 to 0.5mg/l ensures a rapid transfer of oxygen to activated sludge flocs. 2. In the aeration basin: The microturbulence induces very fast movement of the micro-organisms; this, combined with the large contact surface makes more effective transfer of oxygen to micro-organisms. 3. Transitory phase: Between sub-phase 1 and 2 we have a transitory phase 3, at the water surface. The impact from the aerator spray on the water surface induces hydraulic jump and thus surface renewal. 1. The entire floc is aerobic, so we benefit from its maximum biological activity. AquaTurbo® AER-AS is designed for real conditions in activated sludge.